So. I made this gnocchi on TV today. Wait. Let me rephrase that. I attempted to demonstrate how to make this gnocchi dough on TV today. What I actually did was just kind of mush my hands around in a pile of egg yolk, ricotta, and sweet potato. Six minutes is, apparently, a lot shorter than it seems. I did, however, succeed in making a very brilliant mess. The mess, a real sticky, floury one, it was tops. So don’t do that at home! Do what I say to do below instead. Then you will have beautiful, fluffy pillows of lightly spiced goodness. That said, it was such fun, a learning experience if you will, and next time I’m going to fully embrace TV magic and come with everything already made. Everything. And there will be a next time. And that next time will be a dadgum pie. I will vanquish the short cooking demo TV segment with pie, you’ll see. All it takes is a sense of touch. Think with your fingers. You don’t want your dough too sticky to handle nor do you want to add too much flour. So just add flour bit by bit, I usually start with half a cup and add 1/4 cup at a time after that up to 1 1/4 cups total. So just add it until your gnocchi is a workable, soft play-dough-like consistency. Adding too much flour will make your gnocchi tough, so easy does it. The excellent thing about this is once you’ve made your gnocchi and lined them all up on your baking sheet like little soldiers you can freeze them (on the sheet tray to prevent sticking) and then toss them all in a ziplock in the freezer and keep them for up to 3 months. Which means that nothing stands between you and impromptu homemade gnocchi but a pot of boiling water, about 3 minutes, and deciding what to put with them. And I’m here to help with that last part. Figs! Buttermilk mornay (aka cheese sauce)! Pancetta (aka bacon)! If this seems odd, just trust me. It’ll be real good, baby. You’ll see. We eat a lot of sweet potatoes when they abound at the market, specifically, we eat a lot of baked sweet potatoes. Butter, salt, and little else. But even for sweet potato enthusiasts such as ourselves (I think the high levels of potassium excite us…), baked sweet potatoes night after night can get boring. Herein lies the solution. The other great thing about these gnocchi are how affordable they are. I don’t usually go on about how quick, cheap, and convenient things are (though these are all of those things). I think that sort of mindset and language reduces your meals to a love affair in the red light district. Even still, the beautiful thing about shopping at the market and using raw ingredients instead of preprepared ones is that you do save money in cutting out the middle man. Added bonus, you get a far better tasting product and your money goes to your community. Wins abound. Velvety is a food word, a food word that one arguably should eschew. That, unfortunately, just isn’t practical in this situation. These are, for sure, velvety. The sauce is velvety. Hell, the figs are velvety. The crispy pancetta adds just the right amount of crunch to offset it. And the flavor profile is a well orchestrated team effort. 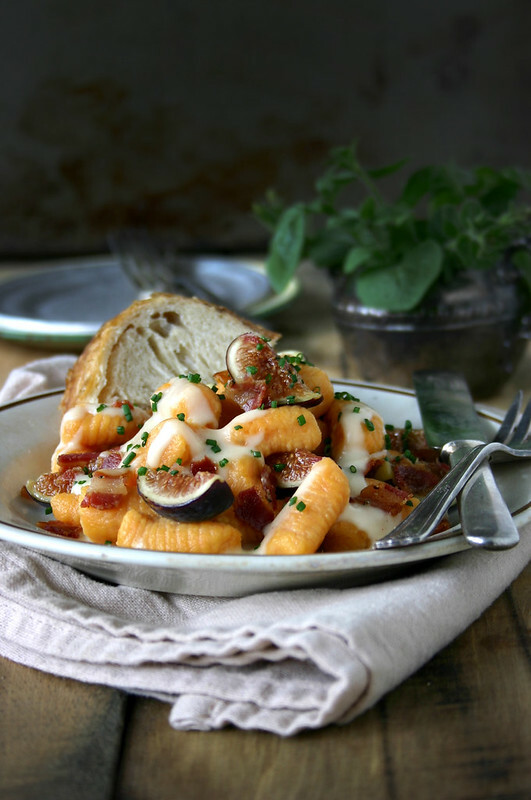 The lightly spiced gnocchi are creamy and ever so slightly sweet as are the figs while the buttermilk mornay chimes in with tangy, salty notes which are further punctuated by the pancetta, and all of it is brightened with an herbaceous bite from either chives or sage. A peppery green like watercress or arugula would be good here too. This is nonna meets grand-mère meets grandma, an Italian classic in a French sauce with Southern flavors. In short, no matter where you are or hail from, this is comfort food for fall. Prick potatoes all over with a fork and steam in microwave wrapped in damp paper towels until tender all the way through when pierced & fully cooked. Rotate half way through cooking, about 3-5 minutes per side for medium sized potatoes. Alternately, roast in a 400° F oven about 50-60 minutes. Drizzle potatoes with egg yolk, crumble the ricotta on top, and sprinkle ½ cup of flour on top. Using a bench scraper or spatula, cut the flour, yolk, and ricotta into the potatoes using a chopping motion until beginning to become incorporated. Then start using the bench scraper to fold the mixture together. Sprinkle with an additional ¼ cup of flour, and chop/fold it in. At this point I switch to using my hands, lightly floured. Gather the dough into a ball. If the dough is still too sticky to do this, work in up to an additional ¼ cup flour. Pat dough into a disc. If disc is too sticky, sprinkle with another ¼ cup flour. Work in flour, if needed, until just not too sticky to handle. 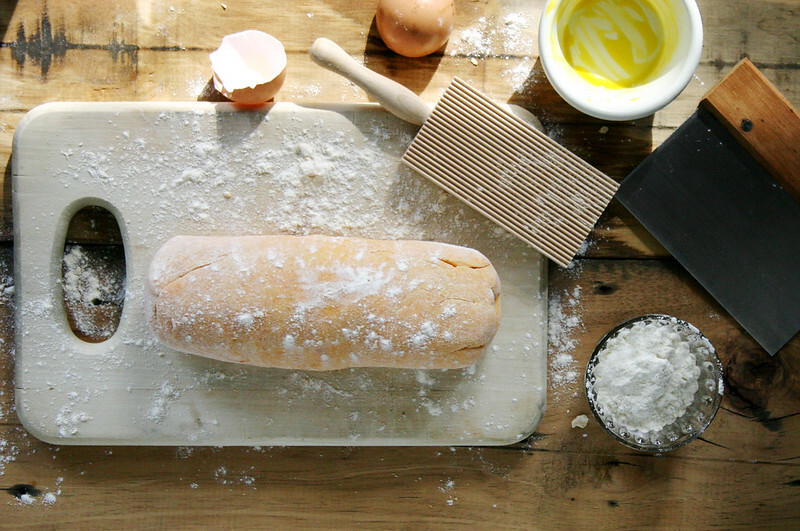 Form dough into a compact log and let rest 5 minutes. Cut log into 8 individual segments. Lightly flour work surface. Roll one segment out at a time into 1” thick logs. Cut logs into individual pieces, about 1”. 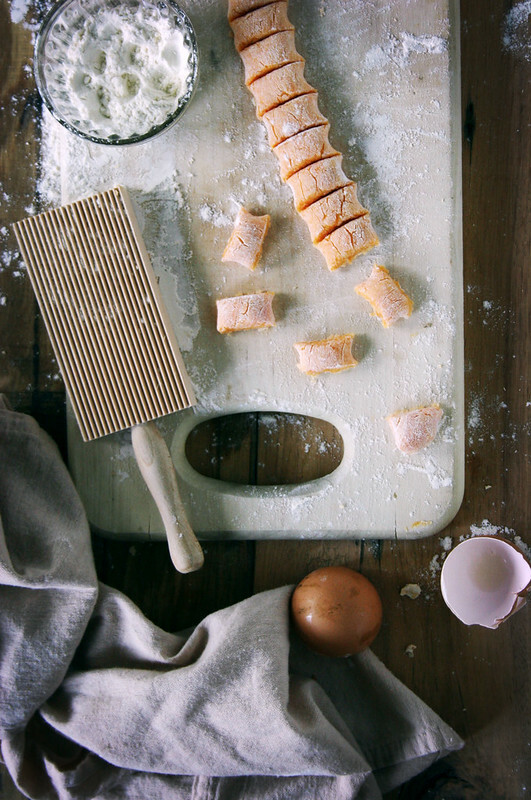 To create grooves, the gnocchi can be rolled on a gnocchi board or the tines of the fork. This step is optional. Place formed gnocchi on a parchment lined baking sheet. Refrigerate until ready to cook if cooking soon, otherwise the gnocchi can be frozen on the sheet tray and then placed into a ziplock bag and kept in the freezer up to 3 months. 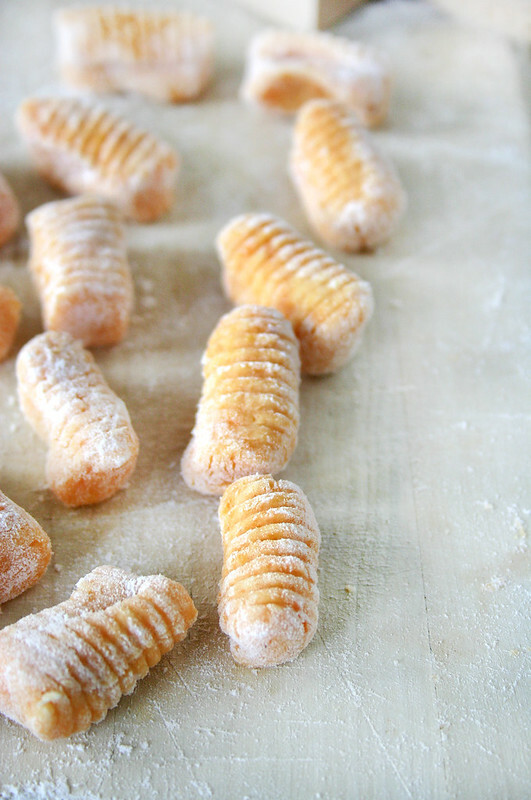 To cook frozen gnocchi just put directly from freezer into boiling water just as with fresh gnocchi, do not thaw. Melt 2 tbsp butter over low heat. Stir in 3 Tbsp flour. Bring roux to a bubble on medium low and let cook about two minutes, careful not to brown. Meanwhile warm buttermilk slowly and ¼ tsp salt until just warm. Do not get it too hot or it will curdle, just warm it gently. Whisking constantly slowly pour warm buttermilk into roux. Bring to a boil over medium high heat and whisk constantly until thickened. Remove from heat, stir in fresh nutmeg & cayenne to taste. Stir in cheese until fully melted. Taste and adjust seasoning if desired. Sauce can be kept warm over a simmering water bath, stirring occasionally to prevent skin from forming or it can be just set aside, uncovered, if using shortly. Again, stir to prevent skin. Bring a large pot of salted water to a boil. Add gnocchi. Give them a gentle stir after a few seconds to prevent sticking. Cook about 2 minutes or until they float to the top. Remove, draining well, with a slotted spoon or spider. 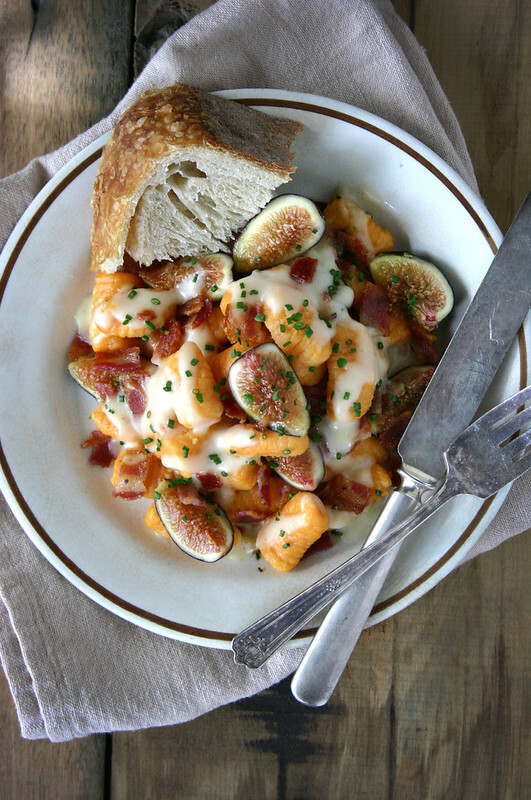 Toss gently with mornay sauce, pancetta, and figs. Sprinkle with chives and serve immediately. 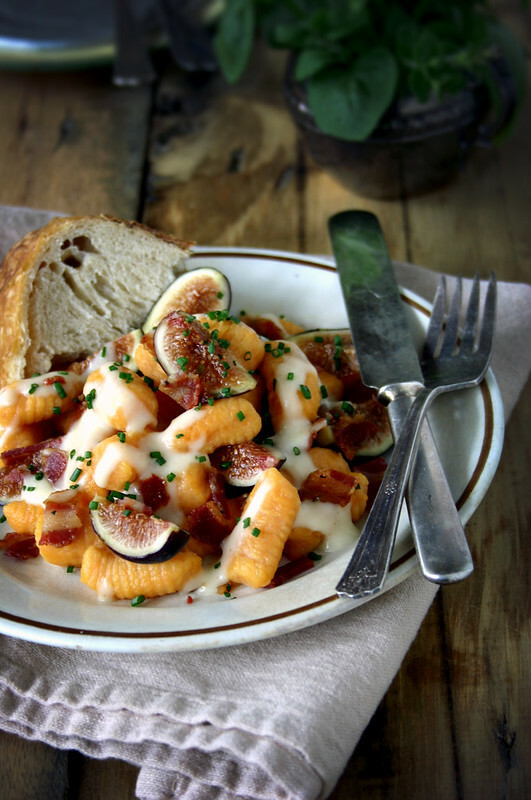 Also, this combination of flavours sounds oh-so-perfect for early fall, and finally gives me an idea for using up the figs I have at home (aside from just eating them, which I’ve done plenty of already). This is totally going on next week’s menu! It’s funny, I went over to my parents and watched the clip and it *felt* like such a bigger disaster than it looked like on camera. It’s weird… perception really is reality (at least one order of reality). What I experienced and what I later watched were two different dimensions! So, so weird… but thank god it wasn’t as fail as it felt!. Let me know how they turn out! I am speechless. This is gorgeous!!! OMG, these look so good! 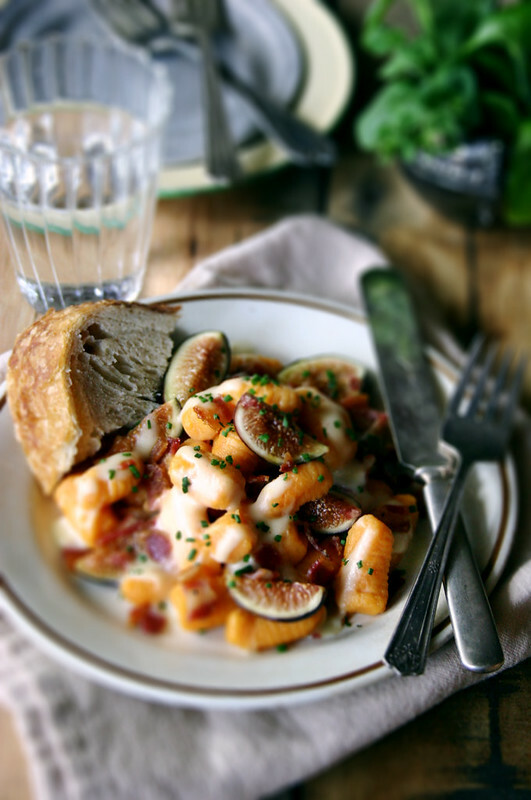 I’ve never thought to mix fresh figs with sweet potato in any form, let alone beautiful gnocchi, but I clearly must do so immediately. I figured that figs do a good job of crossing over into savory (think bacon wrapped figs), and I haven’t been able to stop eating them… so… that’s how they ended up in here! Adore this combination of flavours with the salt and the sweet and the richness and just everything. The rich flavors with the airy texture really did it for me. It’s indulgent but not heavy. Dang….this is so right on. Oh wow. Thank you! Your work is so inspiring… such a compliment coming from you! This looks phenomenal! I’ve been trying to cook gluten free for my Celiac roomie. 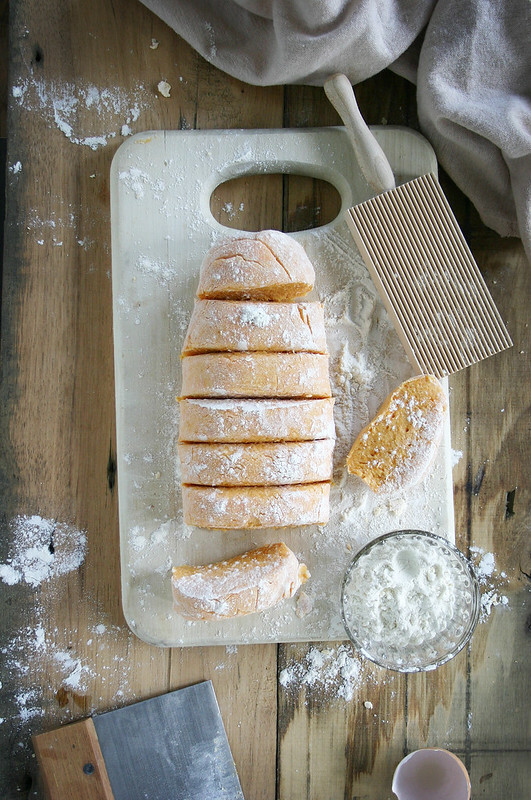 Have you ever worked with gluten free flour and if so, do you think it would work with this recipe? I too would like to know if Gluten Free flour would work. Recently was told to cut all gluten out if my diet and I am hating life! I’m pretty sure I found my new favorite food that I never knew I always wanted! So yummy! Ok, I am loving buttermilk, but I did not know you could use buttermilk to make Mornay sauce. I would like to make gnocchi and homemade pasta, but for some reason I keep putting it off. I have been doing some grand-mère cooking research so when I saw this recipe my ears got pointy. I will have to try this. Do try it. But if trying a buttermilk bechamel/mornay be very careful to heat the buttermilk slowly and to only get it warm. It will totally curdle on you. If you see it separating a little bit, I usually can just whisk it in and get it creamy, but sometimes if I’m not careful it goes to far. So yeah, easy does it. But it’s so worth it for the tang! P.S. I forgot to ask about tv. Are you doing a show? Can we view it? Elaborate please. I did a short little cooking demo on local tv here. I want to post the link but they are changing how they upload their videos and it’s not up yet! Looks incredibly delicious! I love the colors – so cheerful. And the pattern on gnocchi is so pretty. I’m so sorry your TV debut didn’t go as planned, but these look amazing anyway! I love sweet potatoes, and am always looking for good excuses to use them. I will have to try this soon! Everything about this dish looks delicious. If I ordered it in a restaurant, I couldn’t be happier! Oh my this looks amazing!! 🙂 What great flavors. And also congrats on your first TV appearance. very exciting! Thank you. I won’t lie… I hope it isn’t the last, I’m kind of into it! 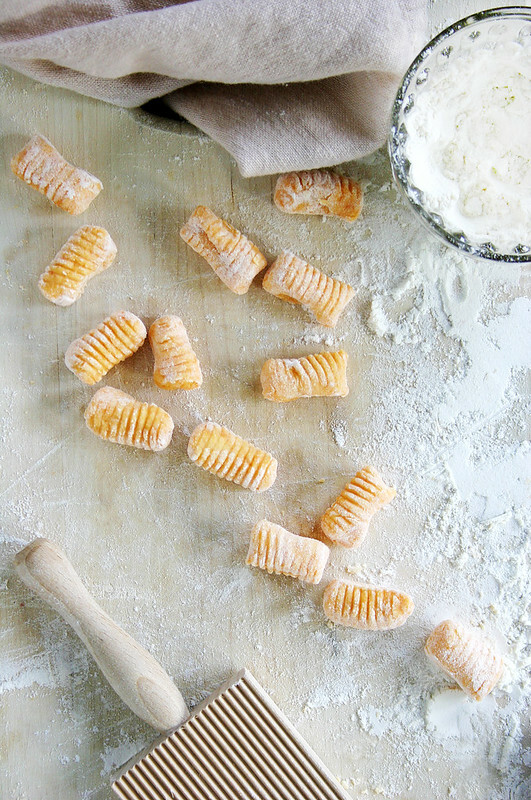 oooh I’ve always wanted to make gnocchi … this looks gorgeous. Congrats on the TV! I bet you did way better than you thought. It always feels bigger in your head. Great info…looks like it will make a brilliant gnocchi…Thanks. UPDATE: ok – I couldn’t resist – I just used butternut squash in place of the sweet potato (and didn’t have ricotta on hand, so just did a simple egg/flour mixture) and I must say – it is dvine. I tried a batch pan-fried in olive oil and butter as well as a batch boiled. I can’t wait to add the ricotta next time and to use the cheese sauce, etc. Oh my – I see gnocchi permutations in my near future! LOVE your blog – you inspire me every day Miss Beth! I’ll definitely have to give this a try. It looks to die for! Made this last week – and it turned out awesome. 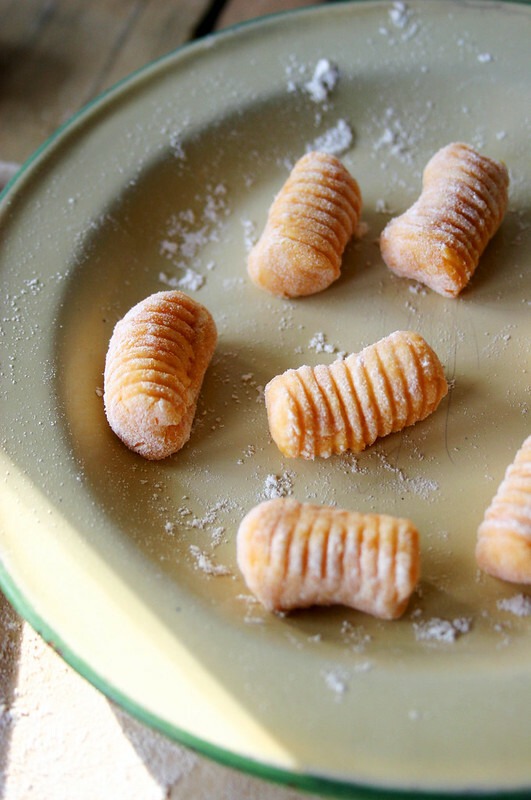 We are only two, so I froze most of the gnocchis for a rainy day, which was actually the next day in the calendar :). This time I gave the pancetta (or in my case bacon) a ride in a pan and I topped it over with the sauce and then the gnocchis (in the pan) – which made the flavors even more incorporated! So glad you made it & super glad you liked it! Thanks for the feedback, always appreciated. Made this for the first time last September when figs were in and it was such a hit, we carried it through to late Fall, making & eating it on the beach on the island, substituting a thick fig preserve for fresh. This recipe has become the biggest signifier that we’re on the cusp of a new season- making it tonight for my 11 year old’s birthday!